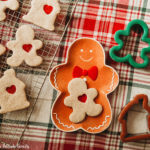 These Stained Glass Cinnamon Sugar Cookies are perfect for Christmas! The first step in making this recipe is to cream the two sticks of butter and one cup of sugar in a large bowl with electric mixer on medium speed until well combined. I like to leave my mixer on for about 3 minutes to get the butter light and fluffy. Next, beat in one egg and vanilla extract until blended. In a separate bowl, combine the flour, baking soda, cinnamon, and salt. Add the flour mixture to the creamed butter mixture until just combined. Move the cookie dough into a large zipper bag and refrigerate for about one hour. You can also refrigerate it overnight, but you will have to allow it to sit on the counter several minutes so that you can roll it out. Preheat your oven to 350°F. Roll the dough at a time on floured surface to 1/4-inch thickness. Cut out your favorite holiday shapes. We made gingerbread men and houses. If you’d like to make the red stained glass hearts, use a small cutter and remove the heart piece. If not, these cinnamon sugar cookies are delicious on their own. Place the cookies 1 inch apart on a lined cookie sheet. Now, this is the important part. Place the hard red candies in a small zipper bag. Use a hammer to crush them. Allow the cookies to bake 9 minutes, remove from the oven, fill the heart cutouts, and return to the over for 3 more minutes. This will give you a crunchy cookie when cooled with a beautiful red stained glass heart in the middle. When you remove the cookies from the oven, allow them to cool on the parchment paper, placed on a cooling rack.Otherwise, the candy will be too gooey and stick to the paper. When the cookies are completely cooled, enjoy them with your loved ones!